I’m enjoying learning about being more productive and putting new systems and structures in place. For myself, my business and my family. I’ve been listening to How to Be a Productivity Ninja in the car these past couple of weeks, and have just ordered the book. There’s so many ideas in this book to help us in our work, home and business. The difficulty I’ve found with the audio book is that I had no way of writing down the notes and checklists! Hence the need, for me, to have a hard copy to refer to. The biggest learning point for me has been about “The” To Do list. Graham Allcott made so much sense when he talked about a Master To Do list, which includes the weekly shopping, daily exercise, PLUS the Projects you’re working on. A project is anything which has multiple “to dos” on it. It could be booking a holiday, or building a website, or a creating a marketing strategy. This was a major “ah ha” moment for me! A project may be ongoing for a few months, yet it sits on the “to do” list and is often a frustration as it looks at you every day. Often a project is something worked on by a few people. A website for a client will be at least a two-way process. People need time to think and reflect to get the right feel for them. But when you’ve allocated time in your diary to complete certain tasks, it can be frustrating when said client doesn’t get back to you when you’ve agreed they would! So having a “Waiting” list where you’re waiting for someone else to do something is a perfect way of moving it off your immediate to do list, without it being lost and forgotten about. 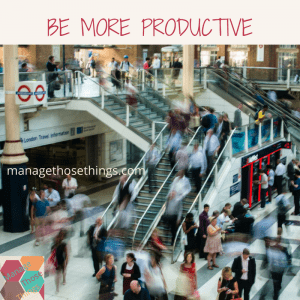 That may sound contrary – needing time to be more productive! However, what I’m finding is that I need to create space to get things organised. Create new systems and structures. Try things out. And de-cluttering the office doesn’t happen without putting some time and effort in. The Productivity Ninja book suggests we all need monthly, weekly and daily checklists. They’ll take time to set up and trial and review. You may need time to get your email to zero for the first time in a long time. I’ve made a start, but I’m not there yet. Although those last 200 emails from ages ago are probably not important. My guess is that they’re newsletters I signed up to that I didn’t have time to read when they first appeared in my inbox, and I haven’t added “reading time” to my weekly checklist before now. So, in theory they should be easy to clear when I have my “weekly productivity review” time this week. So, I’m looking forward to testing out some of my new systems this week. I’ve started my lists and systems, but I have to use them – will I need something on my phone as well as my trusty notebook? Or will the spreadsheet I’ve set up work well for me? It’s going to take time, and as Graham Allcott says at the end of his book, he doesn’t always get it right. He does however share a lot of productivity tools for being more productive. I highly recommend you review your systems and procedures regularly, even if you’re already a productivity ninja. Life and technology moves on. New “things” come into our lives which we need to do and keep on top of. The Business Cheerleading Club members are constantly talking about their schedules and getting it right for them. It’s a work in progress for most of us. So if this is an area you’d like help with, join us. They’re all happy to share their tips. I’d love to hear how you keep productive. Leave a comment below.